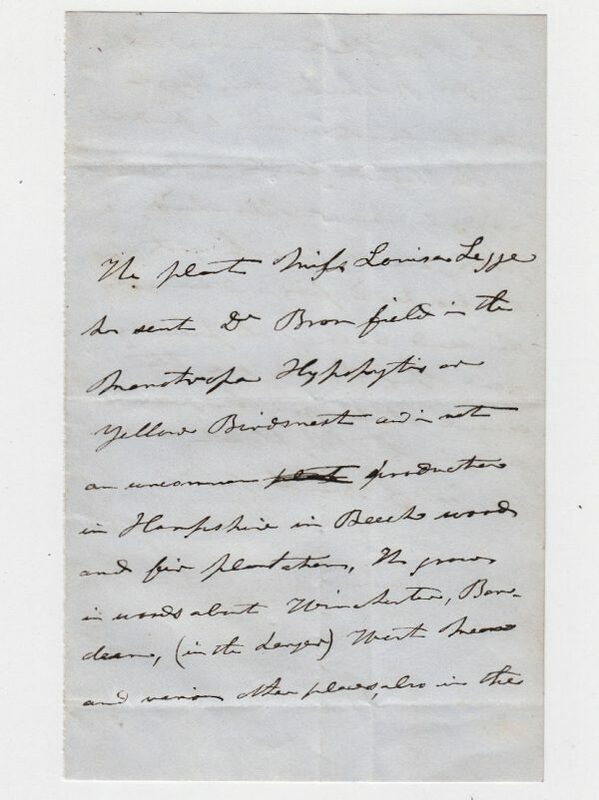 Autograph Letter in the third person, to Miss Louisa Legge, identifying her plant as Yellow Birdsnest, an uncommon Hampshire plant, and discussing its habitat. 2 pp. 7 x 4 inches, in good condition. Undated. William Arnold Bromfield (1801–1851), English botanist and traveller, author of Flora Vectensis, a description of the plants of the Isle of Wight, and Letters from Egypt and Syria, both works being published posthumously in 1856. In September 1850 he embarked for the East, and spent some time in Egypt, penetrating as far as Khartoum. After a year of travelling in the Near East, he was attacked by malignant typhus at Damascus, and died on 9 October 1851. His collections were sent to Kew, some of the contents being shared amongst his scientific friends.